Looking for something a little bit different for Father’s Day this year? 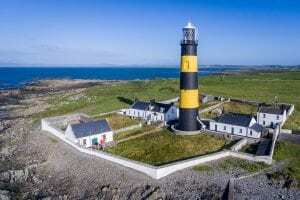 Why not give Dad the gift of a heritage break in an Irish Landmark Trust home. If only our Irish Landmark houses could speak…. they could provide us with in depth accounts of social change which has occurred within an Irish family context. It is highly unlikely that many of the resident fathers of our eighteenth and nineteenth century houses pushed babies in perambulators around their estates, changed nappies, nurtured their children or involved themselves with their offspring on any emotional level. Nowadays, the giggles and laughter of children playing hide and seek in the nooks of crannies of an Irish Landmark Castle, Lighthouse or Country House is a familiar sound. Very often there is a father in the mix instigating the play and joining in with the fun. Rescuing old buildings certainly enables new life to breathe and to reverberate. It is lovely to think of these corridors echoing back to the past and capturing the social change and positive transformations that the role of Irish father has historically undergone. So if a short stay in a Lighthouse, Country House, Gate Lodge or Mews could be just the thing he needs to feel the love this Fathers Day. If Dad needs a digital detox, or some time in the great outdoors an Irish Landmark Trust break could be just the tonic. If lighthouses are the attraction, there are still opportunities for a last minute Father’s Day getaway to Loop Head or St.John’s Point in Donegal. On the other hand, if fishing is how your special man likes to unwind, Knocknalosset House in Co. Cavan is just the place. He’ll be spoilt for choice with all the rivers and waterways in the area. But if it’s a romantic break with the love of his life, then we still have availability at Batty Langley Lodge in Leixlip. Drum Gatelodge in Bushmills, Railway Crossing Cottage in Donegal or Salterbridge in Co.Waterford. Contact Irene if you want to know more about any of these special places.